Light box therapy is an effective and safe treatment for people suffering from Seasonal Affective Disorder (SAD), or the winter blues, which is a milder form of depression (compared to SAD) that afflicts some people in the winter months. SAD, and the winter blues, are believed to be directly associated with the amount of exposure a person has to daylight. Some people spend the late fall and winter months feeling exhausted, depressed, unable to handle social interactions, unfocused, and experience weight gain. During the course of light box therapy, energy levels increase and people start to feel less lethargic. Depression symptoms start to lift and the daily light box therapy treatment helps people feel like themselves again. It is believed that light box therapy affects the part of the eye which communicates to the brain, affecting mood. What is involved with Light Box Therapy? With light box therapy, a person sits near the white light for a set amount of time on a daily basis. Each person must establish their own specific guidelines for what time they conduct their daily light box therapy, and for how long they sit near the white light. This type of therapy is highly individual and will depend on what works best for each person. However, most people choose to sit near the white light first thing each morning. Light box sessions can be as little as 10 to 15 minutes near the light for some people, and as long as an hour for other people. How quickly will Light Box Therapy work? Light box therapy works for some people in a little as 3 to 4 days. It should not take long after starting light box therapy treatment to feel relief from some SAD symptoms, or to feel increased energy for those suffering from the winter blues. 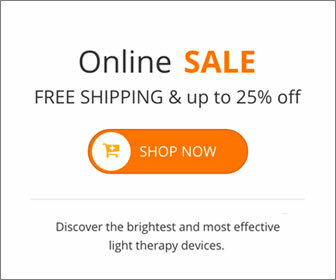 If you don’t feel any different after a week or two of using light box therapy, you should consult a doctor about finding a different type of therapy to treat your depression. Will Light Box Therapy work for me? There is no guarantee that light box therapy will alleviate all of your symptoms, but research has shown that it works 80% of the time with those suffering from SAD. That means there is a great chance that light box therapy is the answer you have been searching for. What if I have concerns about Light Box Therapy? See your doctor. A doctor or health professional can help you determine if light box therapy might work for you. They can also help you set an appropriate timeframe to start with when sitting near the light and beginning treatment. Where do I buy a Light Box to start Light Box Therapy? There are many online retailers of light boxes. Alaska Northern Lights has been selling light boxes for decades and has a history of bringing relief to many people suffering from SAD. The company was started by a husband looking for a way to help his wife. Years later, their light boxes continue to bring relief to many people suffering from SAD and the winter blues. This entry was posted on Thursday, May 1st, 2014 at 7:32 pm	and is filed under Light Therapy. You can follow any responses to this entry through the RSS 2.0 feed.